Nursery/Reception – Bottle green sweatshirt, white polo shirt, grey or black skirt/pinafore/trousers. A green gingham style summer dress can be worn in the summer months. 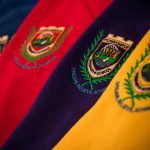 Year 1/Year 2 – Purple sweatshirt/cardigan, white polo shirt, grey or black skirt/pinafore/trousers. A purple gingham style summer dress can be worn in the summer months. Year 3/Year 4 – Red sweatshirt/cardigan, white polo shirt, grey or black skirt/pinafore/trousers. A red gingham style summer dress can be worn in the summer months. Year 5/6 – Royal blue sweatshirt/cardigan, white polo shirt, grey or black skirt/pinafore/trousers. A royal blue gingham style summer dress can be worn in the summer months. Additional Items available to purchase by order form are woollen hats, backpacks, book bags, shoe bags, fleece jackets and waterproof jackets. P.E. Uniform: White P.E. T-Shirt and navy blue shorts (indoor). Navy jogging bottoms, navy top and white t-shirt (outdoor). See Policies and Procedures for further information. Our uniform provider is Emblematic, who are based in Newcastle. Parents can order on-line directly with Emblematic by clicking the link below, delivery can be made direct to your home address or to the school address. You may also you can complete an order form at the school office. Payment must be made with the order as the uniform is embroidered with your child’s name.